* Are you consistent about putting food out? If you only put out food occasionally, it may take the birds a while to find it. If you only put food out in certain seasons, it might also take the neighborhood birds some time to realize that food is now available in your yard. * What kind of food are you putting out? Each type of bird has their own preferences, although black oil sunflower seed appeals to many of the birds we typically like to attract to our feeders. (Try sunflower hearts if the black oil seed shells make too much mess.) Cardinals usually love safflower seed while sparrows, juncos, mourning doves and many other ground feeders (including starlings and cowbirds) like white millet. In warmer months, sugar water mixtures appeal to hummingbirds. Suet appeals to many birds in the winter as well as in their breeding seasons. Many of the cheaper wild bird mixes are full of filler seed that birds either don’t usually like or that appeals to birds we aren’t always hoping to attract. Some birds don’t eat seed at all, and are instead attracted by things like berries or pine cones they find on the bushes and trees and other plants in your yard. Cornell Lab’s FeederWatch site has a chart to help you pick foods for the birds you are hoping to attract. * Is the food fresh? Goldfinches are notoriously picky about their Nyjer seed and no bird is going to be thrilled with moldy or dried up stale seed. (Moldy seed is also not healthy for them.) If the seed is wet and clumped or full of cobwebs or has been sitting out in a feeder for months, it is time to get rid of it and start fresh. * Are you using the right feeders? Different birds like to feed in different ways. A woodpecker is going to favor suet against a tree (although some will agree to visit suet feeders hanging free, something you may need to do to deter Starlings from the suet.) Cardinals tend to favor platform feeders. Juncos and sparrows like to feed on the ground, although they will consent to a low platform feeder on the ground if they must and the more bold of them will sometimes give a hanging feeder a try if that is where the seed is found. Finches will feed from tube feeders, platform feeders on the ground, etc. Research the birds you want to attract and put the food they like into the type of feeder that suits them. * Is your yard bird-friendly? Many feeder birds appreciate quick access to cover so they can escape from predators. A feeder on a pole out in the middle of a barren yard of cut grass may detract squirrels but may not get as many customers as a more thoughtfully sited feeder. You want feeders to be not right on top of bushes where neighborhood cats can lurk but also not too far away from bushes, brush piles, trees or other cover. My yard has a lot of old trees that drop branches. I gather them up as they fall to add to brush piles I’ve built in my feeder areas. 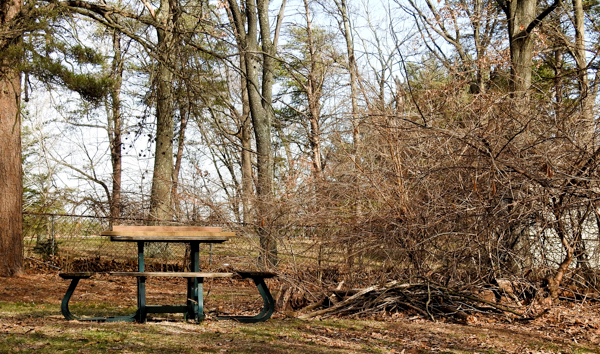 I also have a ground platform feeder placed under an old picnic table near a wild tangle that is popular with the birds, I think because it offers some protection from hawks. * Is there water available? One of the best ways to attract birds is to provide water. You don’t have to spend thousands on a fancy pond or even hundreds on birdbaths. An inexpensive shallow pot saucer from the local hardware or nursery placed on the ground a few feet from some cover will thrill many birds. 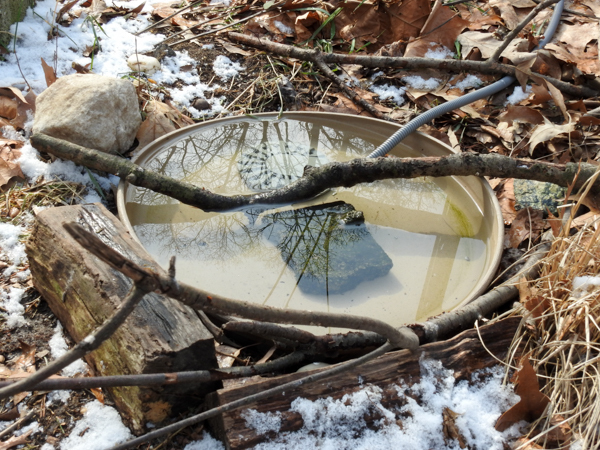 In the winter months, consider a heated pet water bowl or add a de-icer to a regular birdbath. You’ll be the talk of the local birds if you have water available when it is frozen everywhere else. * Is your yard busy? If you are placing your feeders in an area with a lot of human activity, some of the shyer birds may stay away. Think about where your feeders are located. Right next to the door might make it convenient for re-filling the feeders, but you might get more customers if there is a little distance from where people come and go all the time. * Are there predators stalking the bird feeders? 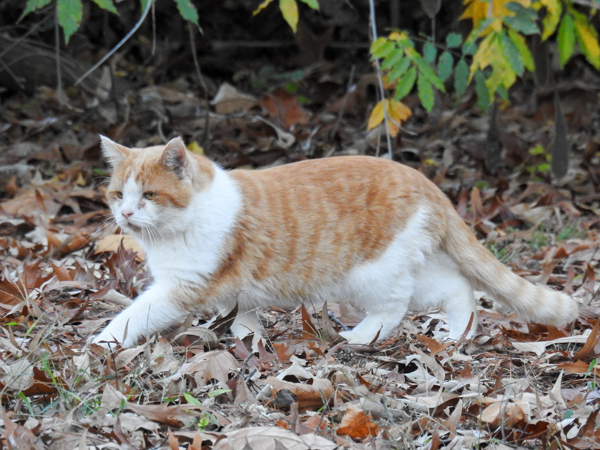 In my neighborhood, there are quite a few feral cats, as well as neighborhood cats whose owners let them wander during the day. Now, I love cats. (We’ve got four inside cats that were originally feral.) But even well-fed cats do like to stalk birds, something I don’t tolerate around the feeders. The birds keep an eye out for them and will usually back off from the feeders until the cat moves on. As long as the cat doesn’t linger in the area, the birds usually come right back. A hunting hawk on the other hand, can scare birds away from the feeders for hours or even days. Birds take hawks very seriously! Sometimes you’ll see recommendations to take feeders down for a week or two if a hawk is hunting around your feeders and you don’t like it. I find that the local birds will often make themselves scarce which encourages the hawk to move on . . . temporarily. The hawks generally come back eventually because they’ve got to eat too! 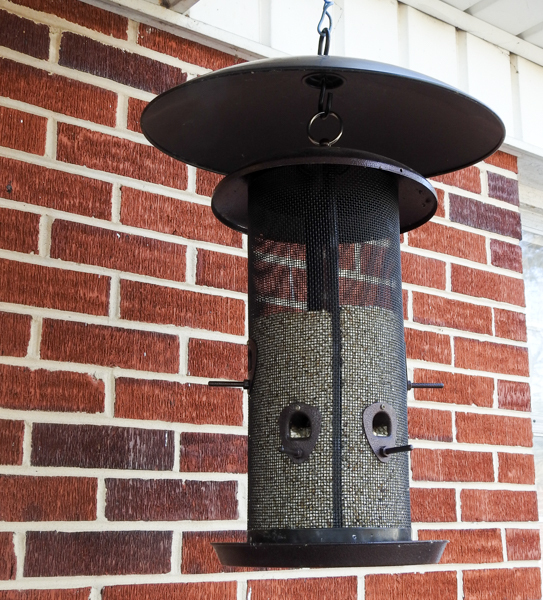 Feeding birds can be as easy is filling a bird feeder and hanging it up outside. But there is usually a bit of problem solving that goes into it. When problems come up, spend some time observing and thinking about it from a bird’s point of view. You may need to try a few things before you find what works. You might think that this is a bad thing, but I don’t think so. When you see something that isn’t working in your bird feeder set-up and find a solution, it feels really good, like solving a puzzle.